EggNots were created as an alternative to real eggs for kids with food allergies. 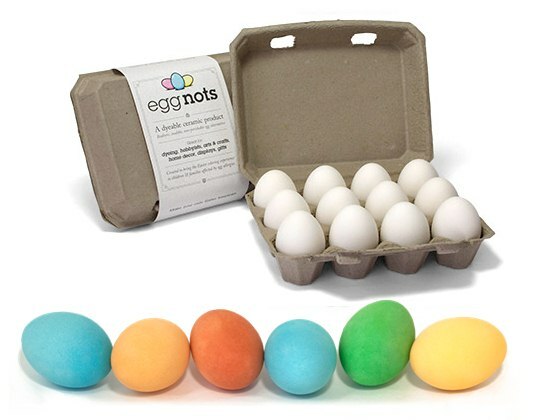 However, they’re also perfect for vegan kiddos who want to dye Easter eggs just like everyone else. EggNots are a realistic egg alternative that look and feel like the real deal, but they are ceramic. These little eggs are non-perishable and eco-friendly because they will last forever and you can reuse them and redecorate them annually. EggNots are much more convenient than real eggs, with no boiling or disposal required. Best of all, zero cute chickens were harmed to produce these eggs, and they’re 100% vegan-friendly. You can decorate EggNots just like you’d decorate real Easter eggs, with plain dye or leaf imprints. You can get the EggNots Easter egg dye recipe, use a store-bought natural dye or try our recipe for safe, homemade all-natural Easter egg dye. EggNots were created as an alternative to real eggs for kids with food allergies. However, they're also perfect for vegan kiddos who want to dye Easter eggs just like everyone else. EggNots are a realistic egg alternative that look and feel like the real deal, but they are ceramic. These little eggs are non-perishable and eco-friendly because they will last forever and you can reuse them and redecorate them annually. EggNots are much more convenient than real eggs, with no boiling or disposal required. Best of all, zero cute chickens were harmed to produce these eggs, and they're 100% vegan-friendly. You can decorate EggNots just like you'd decorate real Easter eggs, with plain dye or leaf imprints. You can get the EggNots Easter egg dye recipe, use a store-bought natural dye�or try our recipe for safe, homemade all-natural Easter egg dye.